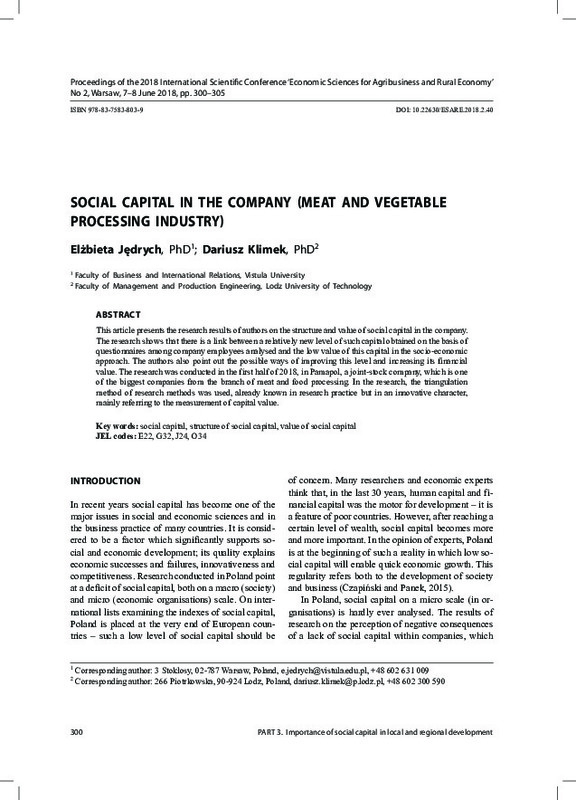 This article presents the research results of authors on the structure and value of social capital in the company. The research shows that there is a link between a relatively new level of such capital obtained on the basis of questionnaires among company employees analysed and the low value of this capital in the socio-economic approach. The authors also point out the possible ways of improving this level and increasing its financial value. The research was conducted in the first half of 2018, in Pamapol, a joint-stock company, which is one of the biggest companies from the branch of meat and food processing. In the research, the triangulation method of research methods was used, already known in research practice but in an innovative character, mainly referring to the measurement of capital value.